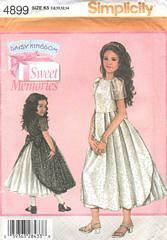 Simplicity sewing pattern from the Daisy Kingdom Sweet Memories series. Dress with above normal waistline has short sleeves, overskirt and back bow. Back zipper closing. Girls' Sizes 7, 8, 10, 12 and 14 are all included. Pattern is uncut and complete. Copyright 2004 and now out of print.